For most Americans, there’s no time of the year quite like the holiday season – and the several months leading up to it. It’s a time of holiday fervor, with images of sparkling garlands, glitzy gifts, and crackling fires taking over screens and billboards across the country. In fact, 9 in 10 Americans celebrate Christmas, and 54 percent treat it as a “cultural holiday” rather than a religious one. The average American shelled out roughly $935 on presents in 2016. We asked 1,016 people of various ages and religious backgrounds about what they’re listening to this holiday season and how early they’re turning up the holiday tunes. Read on to learn more about America’s evolving relationship with holiday music. Pop artists have made a habit of releasing holiday albums, whether it is Justin Bieber, the Jonas Brothers, or even Drake. But what do Americans really listen to during the holiday season? We asked survey participants about their favorite songs. The key takeaway: People prefer some of the most classic hits. Top-ranking songs included “All I Want for Christmas Is You,” “Silent Night,” “Have Yourself a Merry Little Christmas,” and “Jingle Bell Rock.” Meanwhile, survey participants weren’t as crazy for tunes like “Grandma Got Run Over by a Reindeer,” “I Saw Mommy Kissing Santa Claus,” “Santa Baby,” and “The Chipmunk Song.” Interestingly, the most polarizing tune was Frank Loesser’s 1944 song, “Baby, It’s Cold Outside,” which was both equally loved and hated by 13 percent of survey respondents. The song is a perennial source of controversy – some believe its lyrics endorse harmful attitudes toward women. People have their preferences for when they’d like to listen to holiday music, but what is the real shelf life of holiday tunes? 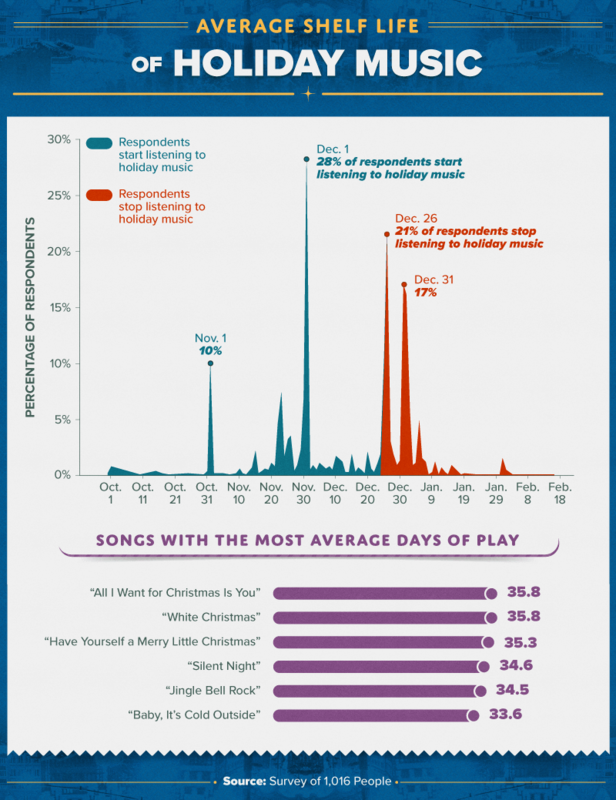 According to our data, most people listened to holiday music from Dec. 1 to Dec. 26. A small portion of survey respondents (about 10 percent) started around Nov. 1, while 17 percent stopped listening to holiday music around Dec. 31. 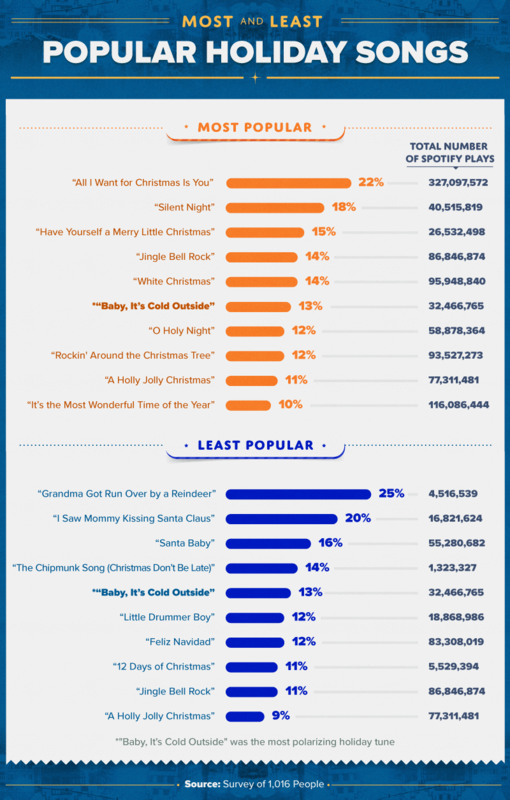 Songs that had the most days of play, on average, included “All I Want for Christmas is You,” “White Christmas,” and “Have Yourself a Merry Little Christmas.” However, “Silent Night” and “Jingle Bell Rock” were also favorites. Holiday music in the U.S. is so pervasive that the average person probably can’t escape a cheery tune here or there during the holiday season. But the average listener actually listens to holiday music much more than that. According to our data, the average holiday music lover voluntarily listened to 65 hours and 24 minutes of holiday music each year. That’s the equivalent of two days, 17 hours, and 24 minutes of listening. And when many people think of holiday music, they’re probably thinking of Mariah Carey. The singer’s 1994 hit “All I Want for Christmas Is You” got at least 18 hours of play every year. 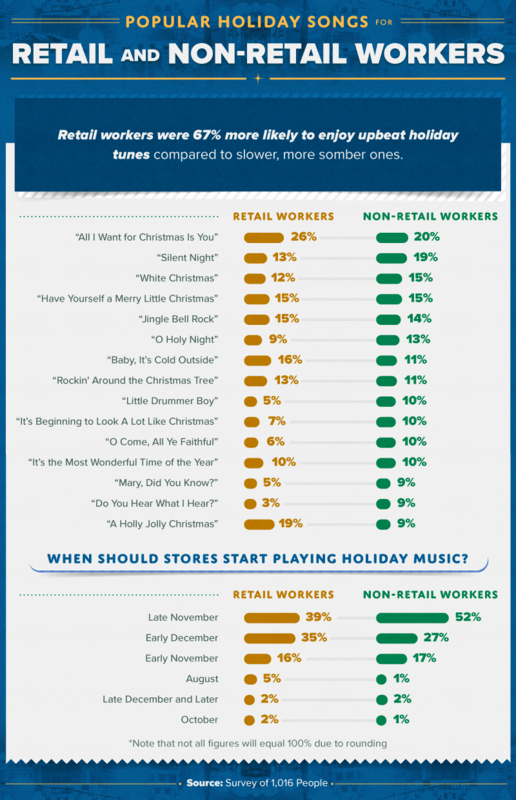 Perhaps no one listens to holiday music more than retail workers. Between ringing up items, stocking shelves, or pinning up signs for holiday sales, store staff sometimes have to listen to holiday tunes beginning as early as October. As a result, they might have different tastes in holiday tracks than consumers. We asked retail workers about their favorite songs and how early they believed stores should start playing holiday music. Interestingly, 5 percent of retail workers said stores should begin playing holiday tunes in August. However, most believed the music should start much later – 39 percent said stores should play holiday music starting in late November, while 16 percent said they should start in early November. Holiday music is often meant to get listeners into the holiday spirit or in a merry mood. But among retail stores, holiday music is often intended to inspire (or remind) shoppers of all the presents that need to be bought. As a leading expert in legal business music streaming, we examined how different genres of holiday music affect retail shoppers’ habits during the holiday season. According to our survey, traditional holiday music influenced people to shop most. Fifty-eight percent of survey respondents said that classic tunes encouraged them to shop in a store. Fifty-six percent said this genre made them happy, while 48 percent said it encouraged generosity and made them spend more time in the store. Pop holiday music had the second-best effect, with 43 percent of survey respondents claiming it encouraged them to shop. Retail stores interested in attracting shoppers during the holiday season may have to pay attention to their clientele’s age. 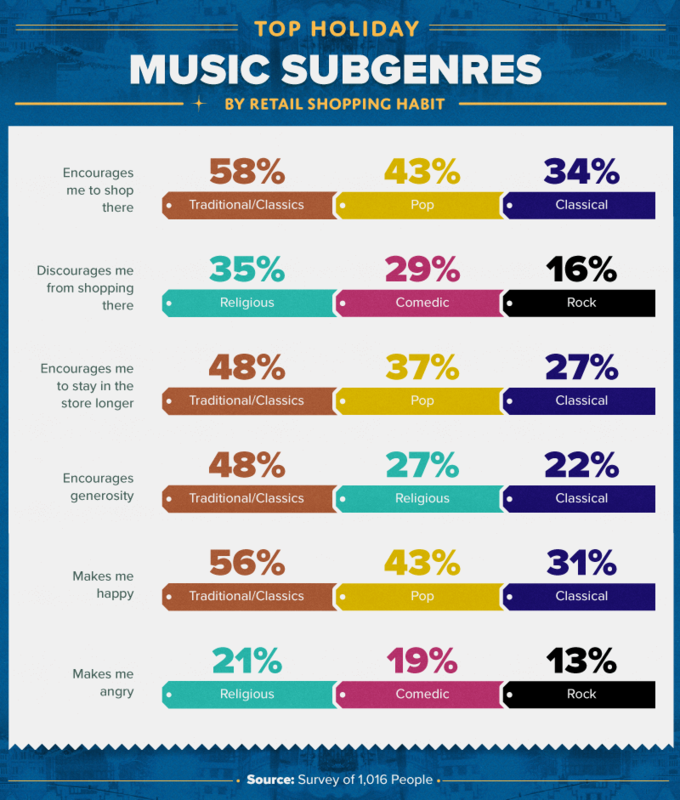 According to our data, generations of shoppers differed in what subgenres of holiday music encouraged them to shop. While traditional holiday music generally encouraged most consumers to shop, 39 percent of millennials had negative feelings toward religious music. 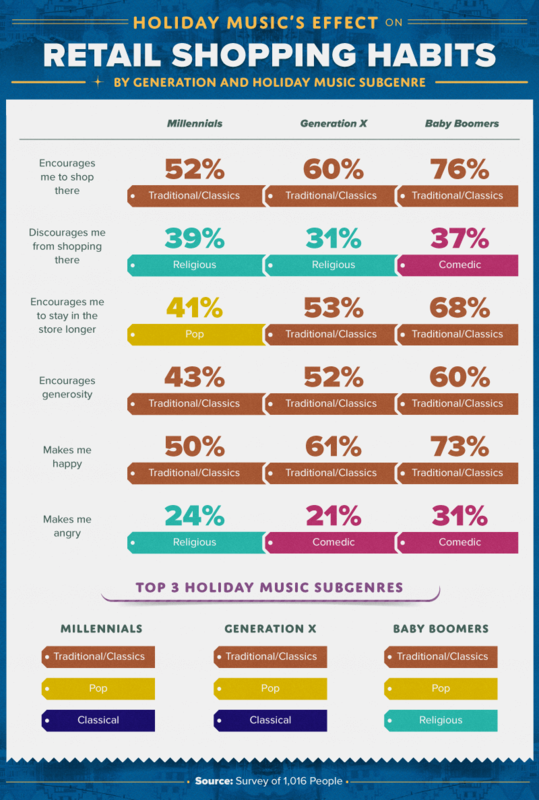 About 31 percent of Gen Xers also felt negatively toward religious holiday music in stores. Meanwhile, 37 percent of baby boomers felt that comedic holiday music discouraged them from shopping. Holiday music dominates radio stations, store intercoms, and video commercials at the end of the year – and, as a result, non-celebrators may still find themselves tapping their feet to tunes like “Jingle Bell Rock.” We asked people of different religious backgrounds and generations about their favorite holiday songs. A controversy surrounding holiday music is whether establishments playing songs with strong religious elements are excluding other religions. We asked people from different religious backgrounds how they felt about hearing religious holiday music in stores and other public establishments. Sixty-one percent of atheists or agnostics responded negatively, compared to 18 percent of those who identified as Catholic. 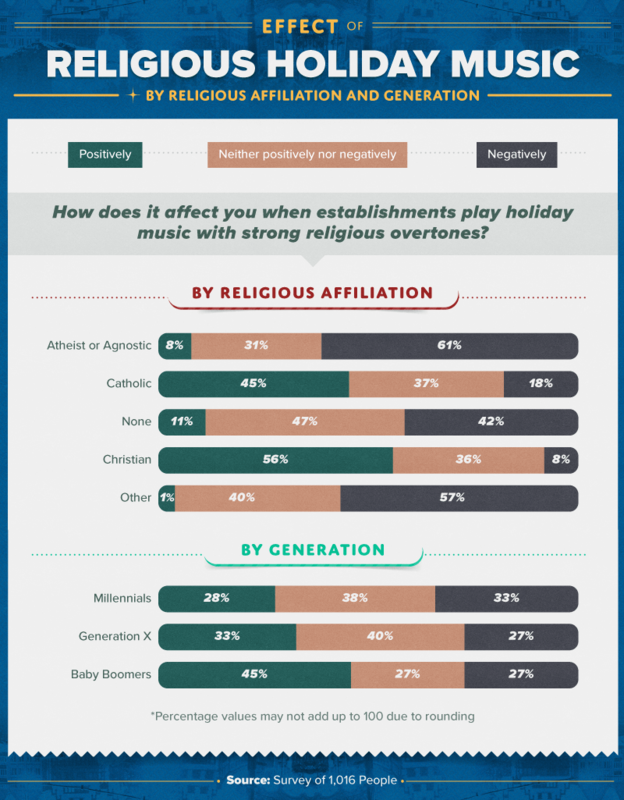 Meanwhile, millennials were the most likely to respond negatively to establishments playing religious holiday music, although there was only a small difference in negative responses from Gen Xers and baby boomers. Holiday music is a central part of the American experience as millions of people usher in the new year. Whether it be a classic hit from the 1940s or recent holiday pop, plenty of people voluntarily (and involuntarily) tune into these songs every year. Our survey is a fun yet meaningful glimpse into America’s changing attitudes toward holiday music. 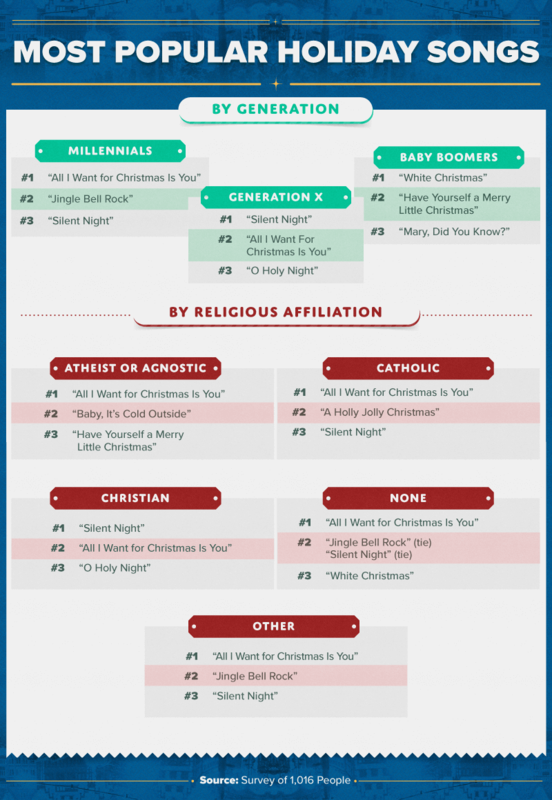 Our findings suggest Americans of all ages and religious affiliations listen to holiday music. Still, disagreement exists as to when stores and other establishments should start playing this music, and people vary in how they respond to holiday greetings from religions different than their own. Our study found that people have a strong emotional connection to music that can translate into positive or negative sentiment during the shopping experience and could even influence consumer behavior. Music matters, and during the holidays, it can be a powerful influencer, so learn more about business-minded music streaming and visit Cloud Cover Music to make informed decisions about the tunes you play for your customers. For this campaign, we surveyed 1,016 people to gather sentiments toward holiday songs. The ages of our participants ranged from 18 to 80 with an average age of 38 and a standard deviation of 12 years. We provided some demographic breakdowns in our assets, which include a generational view as well as a religious one. Thirteen percent of survey participants were baby boomers, 32 percent were Gen Xers, and 55 percent were millennials. Thirty-five percent identified as Christian, 19 percent as Catholic, 2 percent as Buddhist, 2 percent as Jewish, and 17 percent said they had no religious affiliation, while 25 percent considered themselves atheist or agnostic. 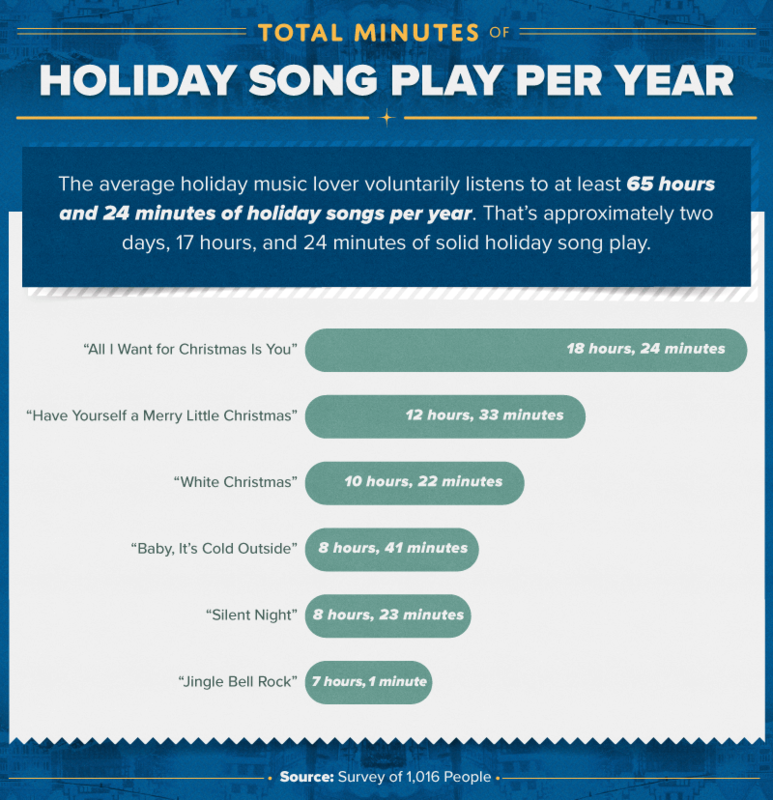 To calculate the number of minutes of holiday music the average listener enjoys each season, we asked participants for how many months, times per week, and times per day they listened to their favorite songs. Then, we found the length of the top songs in Spotify and used it to calculate total minutes of play. For sample size purposes, we did exclude certain generations as well as religious affiliations for assets that showcased those breakdowns. Because these data are self-reported, there are limitations associated, which can include: telescoping, selective memory, attribution, and exaggeration. We did not perform any statistical testing on this survey, and our visualizations are purely exploratory looks at how holiday songs make people feel. Ever notice how the music playing in a retail store makes you feel? We hope you enjoy our study on holiday tunes and share it with other holiday music lovers – for noncommercial purposes, of course. Please link back to us so that we can get credit for our work.